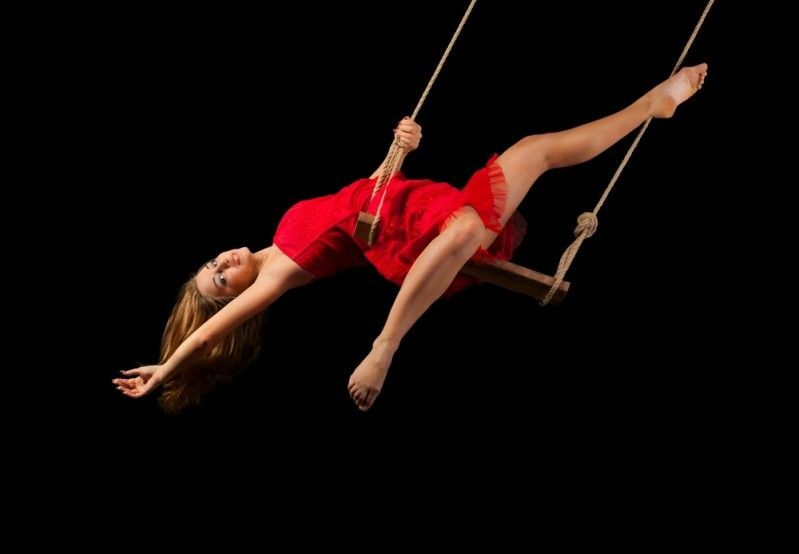 Trapeze is a piece of equipment which is used in Aerial Acrobatics. 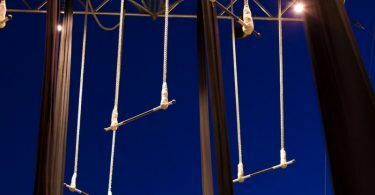 It consists of a horizontal bar which is hung from a roof with the help of two ropes attached on each side of the bar. It is considered to be one of the most demanding aerial arts and it has got a very interesting history. It was during the summer of 1856 when a French young gymnast called Jules Leotard relaxed in his father’s indoor swimming pool. One day, he noticed a line of ropes hanging from the ceiling. He attached a horizontal bar on them, in order to create a handmade chin-up bar. Being an experienced gymnast, Jules began executing numerous acrobatic acts over the safety of his swimming pool. During the same year, he presented the first Trapeze act ever in Toulouse which was his birth town. In order to ensure his safety, he used mattresses stuffed with hay. Until the summer of 1859, Jules had already added a second act in his performance creating what we now know as Flying Trapeze. On 12th November 1859, during a performance in Cirque Napoleon in Paris, Jules swung from one trapeze to the other and became the talk of the town! This number was called “La Course aux Trapèze” and it lasted for 12 minutes. Initially, two trapeze bars were used until they gradually became five. 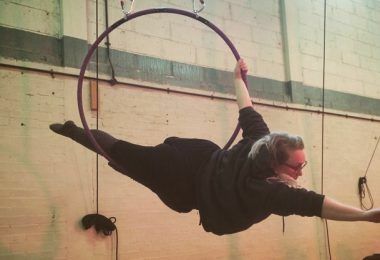 Since then Trapeze performances have become an integral part of the circus repertoire. 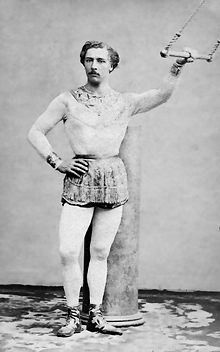 Jules Leotard was not only the founder of Trapeze; he was also a pioneer in dangerous circus performances. 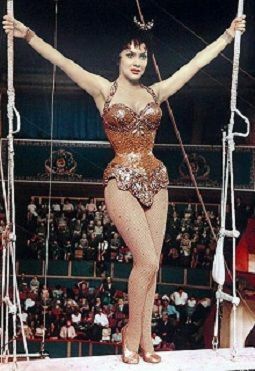 After the trapeze numbers, several other dangerous performances were added such as those with wild animal tamers and acrobats. Another legacy Jules Leotard left to us is the gymnastics bodysuit (leotard) which was named after his surname. He used to wear a bodysuit made of wool so that he can have freedom of movement and avoid the risk of getting a piece of cloth entangled with the ropes. Unfortunately, Leotard was not able to reap the benefits of his success because he allegedly died from typhus or cholera at the age of 28. In the years that followed, a second person was added in the Flying Trapeze performances. His role was to catch the arms of the other acrobat when he swung from the first trapeze to second while he hung from the second trapeze. The first double somersault, from one trapeze to the other, took place in 1897. Later on, 18-year-old Lena Jordan was able to perform a triple somersault.It was considered so dangerous that the Italian acrobats named it “salto mortale” ( “the deadly leap”). Don Martinez managed to break the triple somersault record by achieving 3,5 somersaults. On 10th July 1982, Miguel Vazquez of the Ringling Brothers managed to achieve the first ever quadruple somersault by spinning with more than 80 miles per hour in front of 7000 spectators in Tucson, Arizona. The most recent achievement took place in Stuttgart, Germany. Han Ho Song, a south-Korean performer, managed to achieve FIVE somersaults! 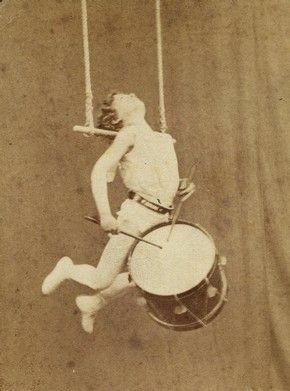 8-year-old Samuel Wasgate (aka El Niño ‘the boy’ Farini) first performed in 1866 in Chelsea Pleasure Gardens with an act called Le Tambour Aerial (the aerial drummer). The spectators were awe-struck by watching a little boy suspended in the air, playing his tambourine and balancing on his neck! This is the first recorded time when a safety net was used. Trapeze is taught in every acrobatics schools. 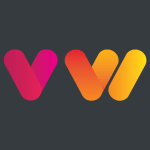 Creativity, sport, discipline and circus prestige are now at the forefront of modern society. Trapeze was a popular activity in gyms until the 1930s when it was banned due to safety precautions.